BRINGING JOY TO ZOO ANIMALS IN FORMER SOVIET COUNTRIES. 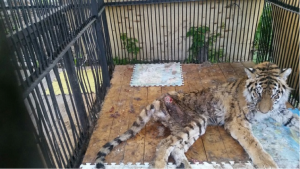 In April 2016 we discovered a horrible animal abuse case at the Almaty zoo, Kazakhstan. We encountered malnourished and sick animals with reduced diet, no qualified veterinary assistance, underpaid and mobbed employees. The last drop was the very sick Amur tigress Kuralaj left to die in agony by the director. Read the full story here. It was too late for us to save Kuralaj, she fell victim of political games, ignorance and indifference. But we couldn’t sit still and let her death go in vain. We decided to make it one of our priorities to improve the standards and conditions captive animals are kept in this zoo and other zoos in former Soviet countries. To initiate the lengthy and difficult change process we immediately exposed the Almaty case to the world by attracting media attention and causing a public uproar. After the massive public outrage the zoo management was removed and replaced with a newly selected enthusiastic young team. At the same time we continued working on bringing experts in Captive Animal Welfare to the zoos in need of help. First such facility was the Rostov zoo, in southern Russia. In July 2016 we arranged a visit by the world renown Animal Welfare and Behavioral Enrichment expert Hilda Tresz, from the Jane Goodall Institute and the Phoenix Zoo, who co-sponsored her trip. Hilda not only helped the zoo staff to responsibly introduce 2 chimps living in solitary confinement, drastically improving their lives (read the full story here), but also held workshops on how to easily and affordably improve lives of captive animals through the use of substrate, special feeding programmes and behavioral enrichment. We broadcast her workshops online, giving access to the keepers from 12 other zoos in the former Soviet countries to learn from Hilda and exchange knowledge with colleagues. Upon the great success in Rostov we started trying to get Hilda to the Almaty zoo, which wasn’t an easy task. It took us several months of e-mails, calls, pulling the strings and planning to finally get invited by the new management. In October 2017, Hilda, together with our Programme Director Ekaterina finally traveled to Russia and Kazakhstan to visit a few selected zoos and offer them any kind of assistance they needed to make the lives of their animals better. The first zoo they visited was the Saint Petersburg zoo in Russia, which, according to Hilda herself, was “one of the best zoos” she has ever visited with a very progressive director and staff, who knew a lot about how to keep their animals happy. Hilda gave presentations about the importance of substrate and the encouraging of natural behavior in animals, such as foraging for food, rather than just free feeding. Among her main suggestions were new larger and more furnished enclosures for some of the animals, in particularly felines, who are currently living in inadequate cages. The zoo has been requesting more land and funding from the government to build those enclosures for years now and we are currently trying to assist them through addressing the city council and administration. 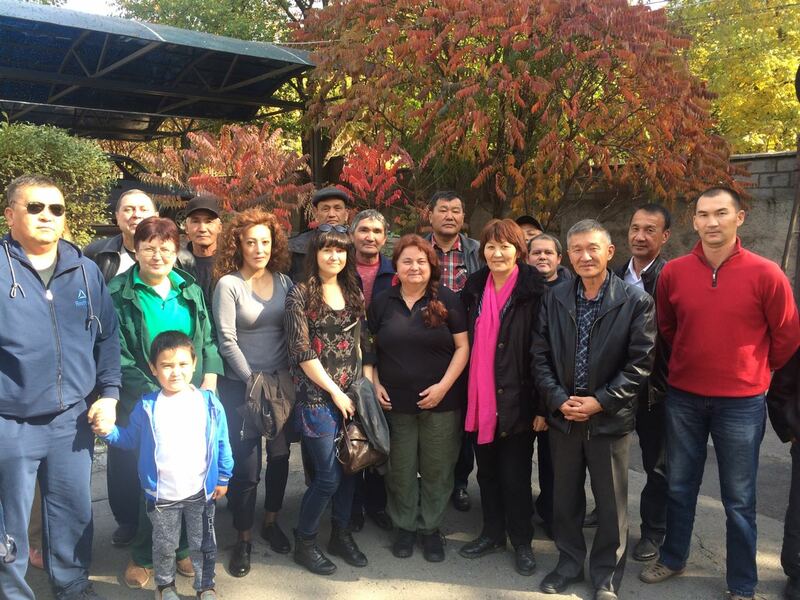 The second zoo Hilda and Ekaterina went to was the infamous Almaty zoo. They met the new great team and gave a series of presentations to keepers, veterinarians and other staff on Animal Welfare and Behavior, the importance of such often overlooked by captive facilities concepts as behavioral enrichment and substrate. While at the zoo Hilda and Ekaterina made sure the animals immediately started to receive substrate and enrichment, and you wouldn’t believe the difference it did for animals! Just look at the chimps, other primates, big cats, foxes and other animals foraging for food and playing with substrate, while just the day before they were sitting bored in their empty enclosures or even demonstrated stereotypical behavior. It all magically stopped when they received something to play with. Just watch the video and see for yourself! 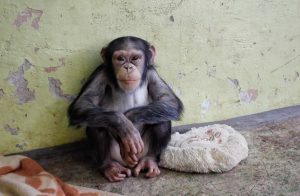 The third zoo was the Rostov zoo, where Hilda visited the chimps she put together the year before. She immediately saw many great improvements, that the zoo made after her previous visit, such as substrate in every cage, better enclosures, many items for animals to play with etc. The Rostov zoo took all her suggestions and improved lives of their animals in a simple and affordable manner! During this trip, Hilda also managed to create a social group of all chimpanzees of the zoo, so that now they all live happily together, as they would in the nature! You can see how vital and effective it is for us to go to these facilities and educate the staff, talk to the people, who actually work with these animals. This programme brings real immediate positive results to many animals and these trips need to become a regular part of our work to help as many captive animals as possible! The list of zoos in dire need of such help is long and we need to build relationships with all of them in order to bring the change in the near future. We cannot do it without your support. Please, donate to help as many captive animals as possible, thank you!